You know how it is, you get peckish and you fancy something specific – like a tuna sandwich. 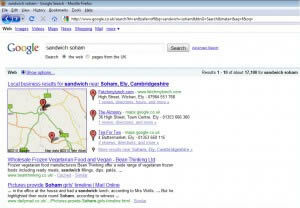 Then you goto good old trusty Google and search for somewhere to purchase a tuna sandwich. Well, this is where the fairytale ends as Googles utterly messed up UK SERP’s continues to cause problems despite Google even recommending them! 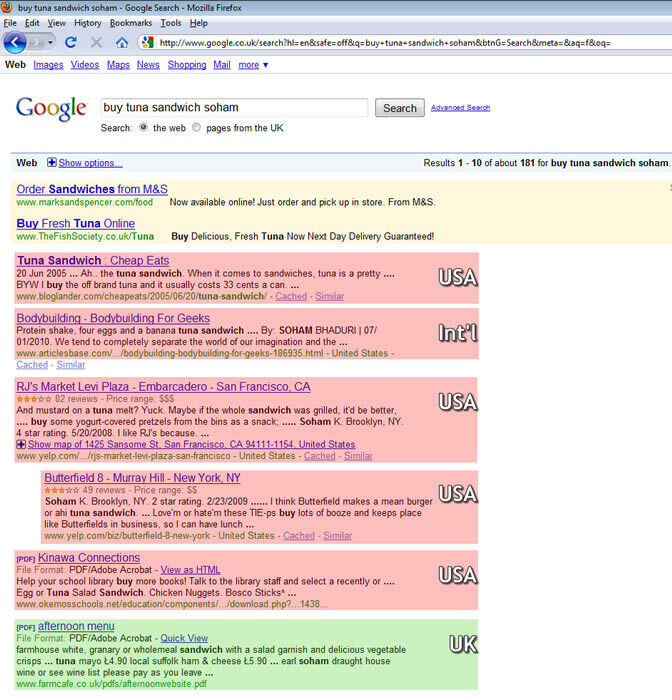 I regularly test random phrases with UK locations to see if Google has bucked it’s ideas up. What a surprise it has not and to prove my point (for which I apologise in advance) I have chosen a little bit of a different slant on WHY Google should know that my local UK result should be relevant. For my latest test this I chose the simple phrase above. I am from the UK and I am very aware that Soham is a small village in Cambridgeshire. Unfortunately know this due to a highly publicised murder in 2002. The problem is, so should Google based on the months of press coverage and the subsequent background stories often referring to Soham as “a sleepy little village in Cambridgeshire”. A search of Soham in Google.co.uk returns at least three news results on the first page referring to the events of 2002 as well as many relevant websites detailing local information about Soham, Cambridgeshire. So why has Google returned this to me? Not only are the UK SERP’s really starting to irate a lot of people connected with Online Marketing and SERP’s but even people I thought wouldn’t have really noticed have started to get the hump – including my family & friends who take whatever Google says as the truth. Surely it’s only a matter of time before something is fixed. However, until that time, it is up to everyone who can shout about it, such as UK Serps, Dave Naylor and more, to continue exposing the many examples of the absolute mess that are the UK SERP’s.